In life, flexibility is critical. After all, things can change on a dime, and without being flexible, you will likely face some very serious challenges. Whether it applies to travel, business and corporate work, relationships, or something else, learning to be flexible will prove to be advantageous. As a prime example, consider flexibility in the workplace. Regardless of the industry, business changes all the time. This is seen in moving stock prices, layoffs, job promotions, added shifts, and so on. By having a flexible attitude and learning to “go with the flow” to some degree, you work with the system instead of against it. 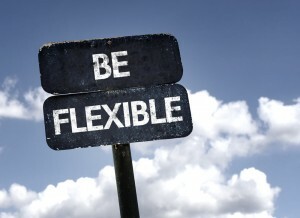 New Opportunities – Being flexible means adapting to change within the organization. If you can shift with the changes, you are seen as a valuable asset. As a result, you will be exposed to new and better opportunities. Work and Life Balance – One of the biggest challenges that people face when trying to achieve great success is failing to balance work and home. However, if you have a family, then there has to be balance. Otherwise, it is usually the family that suffers. When you are flexible, you have the ability to accomplish this goal, which allows you to excel at work yet still maintain healthy family values. Responsive to Change – Flexibility also equates to being more responsive when change does occur. When things at work change, you have to change fast. With flexibility, your response is much faster while still being on target. There are also key advantages of flexibility coming from the employer. Value of Diversity – To be successful, employees have to adapt to change and diversity. To an employer, someone who is flexible demonstrates they value that diversity. Strong Management – Flexibility creates the opportunity for a positive work environment between employers and employees. By being flexible, good managers can adapt to daily changes at work. Win-Win Situation – Flexibility with employees is actually good for the business overall in that it helps build commitment and trust. If you are in a leadership role, it is imperative that you make good business decisions. This means not only being flexible with employees but also using the services of a limo company to save money and ensure the comfort and safety of important guests.